There simply isn’t enough demand for a BMW X7 M right now. Before the X7 broke cover last year, BMW was already considering making a high-performance M version of its new flagship SUV. Sadly, BMWBlog is claiming these plans have been scrapped – at least for now. 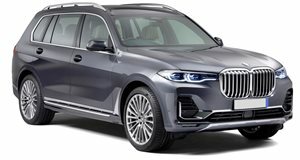 Citing unnamed sources, the publication says there simply isn’t enough demand for BMW to justify the costs required to build a hot X7 M.
This means the XDrive50i is currently the range-topping model in the X7 lineup, which is powered by a 4.4-liter twin-turbo V8 that pumps out 456 hp and 479 lb-ft of torque, enabling the large luxury SUV to accelerate from 0-62 mph in 5.2 seconds. Next year, however, the XDrive50i will be replaced with the more powerful M50i that packs the same engine as the M850i producing 530 hp and 553 lb-ft of torque. If it was given the green light, an X7 M model would have likely used the twin-turbo 6.6-liter V12 engine found in the M760Li, which produces 600 hp. It would have also featured more aggressive styling with larger intakes in the front bumper, wider wheel arches, and a BMW M logo on the gigantic grille. Given the popularity of SUVs right now, an X7 M performance SUV could still happen in the future. BMW will no doubt be monitoring sales of other SUVs in the luxury performance SUV market like the Range Rover Sport SVR and Mercedes-AMG GLS, so we’re hoping the automaker will have a change of heart in the future. First deliveries of the BMW X7 are starting this month. In the US, pricing for the three-row SUV starts at $73,900 for the xDrive40i and $92,600 for the more powerful xDrive50i model.